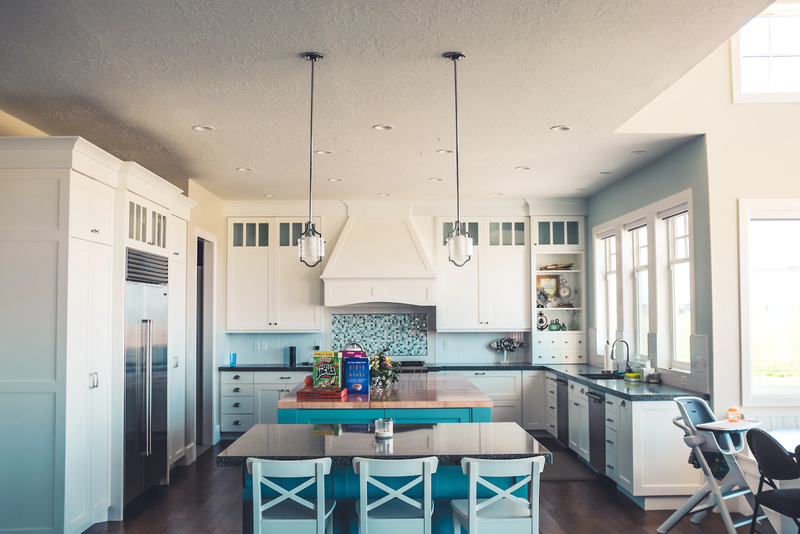 Building or remodeling a kitchen can be exciting, but figuring out which appliances and fixtures, lighting, materials, and overall interior design style to choose can be a lot to handle. In recent years, going with modern, eco-friendly choices is the way to go. The most important benefit of having a “green kitchen” is helping to save our environment, of course. Some other benefits include saving money by conserving water and energy, plus many eco-friendly materials and appliances are safer for our health and our homes. Cork and linoleum are two of the most sustainable options when choosing an eco-friendly flooring. Not only are these options durable and comfy on the feet, they are made with renewable resources and the process to produce them has a low economic impact. Depending on your design style of choice, you can customize cork by choosing a light, dark, or colored cork, and can even make creative designs. Linoleum is great for a patterned floor, but can also very versatile. Wooden floors are most friendly in the sense that they have a long life, therefore reducing natural material usage, but the key is to find wood that is harvested sustainably. Finding a wooden floor that is made of local wood and certified by the Forest Stewardship Council (FSC) will be the best options. Since cabinets are usually made out of wood, be sure that they are FSC-certified and local, just the same as wooden floors. These certified cabinets also use a formaldehyde-free glue and finish, meaning they contain little or no volatile organic compounds (look for products that say no-VOC or lo-VOC). Wheat board or straw board are also eco-friendly cabinet options. By standard, these cabinets are made with recycled agricultural material and are free of formaldehyde products. They are certified by the American National Standards Institute as a medium-density particleboard, which is the material that cabinets are usually made of. Choosing the right countertop for your home can prove to be difficult because it needs to be not only sustainable and durable, but also food safe. There are several options in regards to countertops made out of recyclable, biodegradable materials. A bamboo countertop would be a great choice for a contemporary style kitchen. Countertops made out of recycled paper, recycled glass, or marmoleum are the other highly customizable options. The options are endless when it comes to eco-friendly appliances. Energy Star appliances (such as refrigerators, dishwashers, and oven hoods) are the top-rated energy-efficient equipment and will save you money on your bills. Under-the-sink purifiers, energy-efficient lighting, and hide-away recycling bins are a few other suggestions that will help save money and the environment. There are countless additional gadgets and gizmos that you can find to help you compost, recycle, and save energy. For a lot of households, the kitchen is more like the living room, so let Bow Echo Construction help you create the cleanest and greenest cooking space for your home!